In football, two out of three cases of groin injuries are adductor-related.2 11–14 Low hip adduction strength has been identified as an important and modifiable risk factor associated with an increased risk of groin injury.15 16 Furthermore, >20% deficit in eccentric strength of the hip adductor muscles has been observed among players with groin pain.17 Thus, strengthening the hip adductors may play an important role in reducing the prevalence and rate of groin injuries in football players. In recent studies, the muscle activation patterns and strength effects of various hip adductor exercises have been examined.18–21 The Copenhagen Adduction exercise (CA) has demonstrated high activation of the adductor longus muscle,21 as well as considerable eccentric adduction strength gains following standardised protocols.18 19 The apparent advantage of this exercise is that no equipment is needed and the CA can be performed on the pitch just prior to or after training. However, its preventive effect has not been tested. Thus, the purpose of this cluster-randomised controlled trial (RCT) was to test the effect of a single-exercise approach, based on the CA, to reduce the prevalence of groin problems in male players. This cluster-RCT was registered with the International Standard Randomised Controlled Trial Number registry (ISRCTN98514933) and took place from February 2016 to October 2016. During the 2016 preseason (February and March), we invited teams from the second and third levels (semiprofessional) in Norway to take part in the study. We visited all teams who agreed to participate to inform and invite players to participate. All players under contract with the team were eligible for participation, except those not expected to train or play during the first 6–8 weeks of the season due to injury or illness. The players received verbal and written information about the study purpose and procedures and provided written consent to participation. All players included at baseline were followed until the end of the season (October). We cluster-randomised on a team level to minimise the risk of contamination bias between players in the intervention and control groups. A statistician, who was blinded to the study protocol, performed a computer-generated block randomisation, with block sizes of 4 and 6 in random order. After a team agreed to participate, the principal investigator opened a sealed envelope revealing their group assignment. It was not possible to blind players, coaches or the principal investigator to group allocation. However, a research assistant was blinded and managed all data during the collection period, and outcome measures were not available to any party until all data had been collected. The Adductor Strengthening Programme consisted of a single exercise with multiple levels of difficulty. The exercise was based on the CA as this has previously been shown to be a high-intensity exercise targeting the adductors.21 As the CA might be painful or difficult to perform for symptomatic players, we created two easier levels that players could choose from: level 1 (easiest): side-lying hip adduction; level 2 (moderate): the CA as previously described,21 but with a shorter lever arm; and level 3 (hardest): the CA as previously described21 (figure 1). Videos with detailed information on the performance of each level are available as an online supplementary appendix . (A) Starting/ending position and (B) mid position for the different levels of the Adductor Strengthening Programme. Players were asked to start at level 3. However, if they experienced groin pain during the exercise >3 on an 11-point numeric rating scale (0–10, where 0 is no pain and 10 is maximal pain),25 they were instructed to perform level 2 instead. Similarly, if level 2 provoked pain>3/10, the player was informed to perform level 1. The exercise was performed on both sides. Teams in the intervention group were asked to perform the programme as a part of their regular warm-up, 2–3 times a week for a minimum of 6 weeks during the preseason and maintain the programme once a week throughout the regular season (table 1). At a team visit during preseason, players and coaches in the intervention group were shown how to perform the different levels of the programme by the principal investigator. Team medical staff were also included in the instruction session whenever possible (75% of the time). We encouraged the players, coaches and medical staff to contact us if they experienced problems or any other adverse events when performing the exercise. Compliance to the training programme was based on players’ self-reported number of sessions completed. This information was collected weekly as a part of an electronic questionnaire, which also measured groin injury consequences (see below). To calculate the overall compliance, the total number of completed sessions was summed and divided by the number of respondents. However, to avoid overestimation, players who performed more than the recommended number of sessions were assigned the maximum recommended number. The primary outcome measure was the weekly prevalence of all groin problems registered during the competitive season (28 weeks) using the OSTRC Overuse Injury Questionnaire.10 The secondary outcome measure was the weekly prevalence of substantial groin problems registered during the competitive season. Players were categorised as having a groin problem if they recorded any hip or groin symptoms in the questionnaire, including ‘pain, ache, stiffness, clicking/catching or other complaints related to the groin’, or if they reported reduced training participation, training volume or performance due to groin problems.10 Players were categorised as having a substantial groin problem if they reported moderate or severe reductions in training volume or football performance, or a complete inability to participate due to groin problems.10 The complete questionnaire is available as an online supplementary appendix. The questionnaire was distributed using a smartphone application (Spartanova; Spartanova NV, Ghent, Belgium) during the competitive season. Each player received a notification through the smartphone application to complete the questionnaire every Sunday evening and a short message service (SMS) notification every Monday. Non-responders received an SMS reminder the following Thursday. Players who failed to respond through the smartphone application were contacted by telephone and asked to complete the questionnaire verbally. During the last four weeks of the season (September/October), we visited each club and asked players to respond to the questionnaire retrospectively for weeks with missing responses from the start of the competitive season to the beginning of September. To assist recall, each player was shown a document summarising all their questionnaire responses and match fixtures. The retrospective registration represents a deviation from the original protocol. 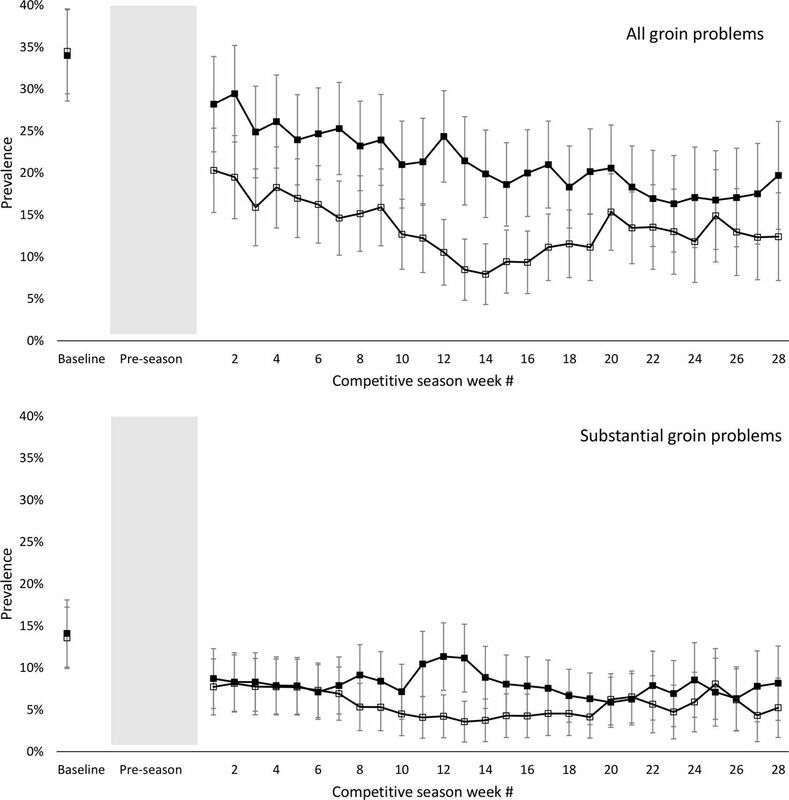 Each week, we calculated the prevalence of all groin problems and substantial groin problems by dividing the number of reported problems by the number of questionnaire respondents.10 At the end of the season, the average prevalence of all problems and substantial problems was calculated, as well as a 95% CI. Finally, we calculated the cumulative incidence for all groin problems and substantial groin problems as the number of new cases each during the study period divided by the number of players included in the intention-to-treat (ITT) analysis. Each week, players reported their exposure to football training (hours), individual training (hours), match play (minutes) and the number of games in which they had participated. The average weekly exposure was calculated for each measure for both groups. The sample size calculation was based on the average prevalence of all groin problems among male Norwegian football players (29%).7 Based on an analysis of variance of within-subject and within-team prevalence, an inflation factor of 1.65, a cluster size of 20 players, a power of 80% and a 5% significance level (α), we estimated the ability to detect a 40% reduction in prevalence with 380 players (19 teams) in each group. To assess the effect of the intervention, we performed two generalised estimating equation (GEE) analyses, one for all groin problems and one for substantial groin problems. GEE was performed using an exchangeable covariance matrix and an α of 0.05 for all analyses. All anthropometric and demographic variables were treated as potential effect modifiers and included as candidate variables in a final multivariable GEE model built using a forward selection procedure. Analyses were performed for the 28-week period during the competitive season (April–October). Missing data on groin problems were imputed using multivariate imputation by a chained equation algorithm in combination with a predictive mean matching approach, which led to the pooled results of five multiple imputed data sets.26 In order to perform imputation with sufficient data, we chose to remove players having <75% response rate (equivalent to <21 weekly reports). The cut-off was based on an assessment of the distribution of total responses, which showed a distinct cut-off at 21 reports. This decision represents a deviation from the original protocol; however, it was made prior to performing the GEE analyses. Primary analyses were performed using an ITT principle. We also performed secondary per-protocol (PP) analyses, in which we excluded players who performed <67% of the programme during the preseason or <50% during the competitive season. We assessed between-group differences in baseline characteristics and exposure using an independent t-test or Mann-Whitney U test, as appropriate. We also assessed differences in baseline characteristics between players included in the ITT analysis and those excluded due to an insufficient response rate (<75%). All analyses were performed using SPSS Statistics for Windows, V.24.0 (SPSS). A total of 35 teams (652 players) were enrolled in the study; however, one team withdrew shortly after randomisation. The flow of the teams/players is shown in figure 2. Baseline characteristics for players included in the ITT analysis are shown in table 2. At the time of inclusion, there were no group differences in the prevalence of groin problems or any of the HAGOS subscale scores. Players included in the ITT analysis did not differ from the players not meeting the 75% response rate criteria in any baseline characteristic or the prevalence of groin problems. However, the excluded players reported lower scores in three subscales of the HAGOS: sport and recreational activities (median 87.5 points vs 93.8 points), participation in physical activity (87.5 vs 100.0) and quality of living (85.0 vs 90.0) at baseline. There were no differences in any of the subscales when comparing excluded players from the intervention group with the ones excluded from the control group. Flow of the teams and players throughout the intervention. There were no differences in exposure to football training, individual training, match minutes or number of games played during the competitive season between the intervention and control groups (table 3). A total of 13 628 weekly reports were registered, of which 17% were registered retrospectively. The average weekly response rate was 74% (range 47%–93%) in the intervention group and 80% (52%–96%) in the control group. Seventy-seven per cent of players included at baseline responded to at least 75% of the weekly questionnaires and were included in the ITT analyses. The average weekly response rate for players included in the ITT analyses was 90% (weekly range 62%–100%) in the intervention group and 90% (61%–100%) in the control group. Furthermore, 21% retrospective data was included in the ITT analyses and 10% missing data were imputed using multivariate imputation. The average weekly prevalence of all groin problems during the competitive season was 13.5% (95% CI 12.3% to 14.7%) in the intervention group and 21.3% (95% CI 20.0% to 22.6%) in the control group. The 28 in-season prevalence measures in both groups are illustrated in figure 3. GEE analyses revealed a 41% lower risk of reporting groin problems in the intervention group compared with the control group (table 4). Prevalence of all groin problems (upper panel) and substantial groin problems (lower panel) in the intervention group (open squares) and control group (filled squares) with 95% CI, measured at baseline and 28 times during competitive season for players included in the intention-to-treat analyses. The shaded area represents the period 6–8 weeks the preseason protocol of the Adductor Strengthening Programme was performed. The average weekly prevalence of substantial groin problems during the competitive season was 5.7% (95% CI 5.1% to 6.3%) in the intervention group and 8.0% (95% CI 7.5% to 8.5%) in the control group. The 28 in-season prevalence measures in both groups are illustrated in figure 3. An 18% lower risk of reporting substantial groin problems was detected; however, this was not significant (table 4). When we removed the players not meeting the PP criteria (≥67% of the programme during the preseason and ≥50% during the competitive season), the average weekly prevalence of groin problems in the intervention group was 11.7% (95% CI 10.9% to 12.5%) while that of substantial groin problems was 4.5% (95% CI 4.1% to 5.1%). Results from GEE analysis are shown in table 4. Groin problems were reported in 2458 of the 13 628 questionnaire responses. The cumulative incidence of all groin problems for players included in the ITT analysis was 55% in the intervention group and 67% in the control group. 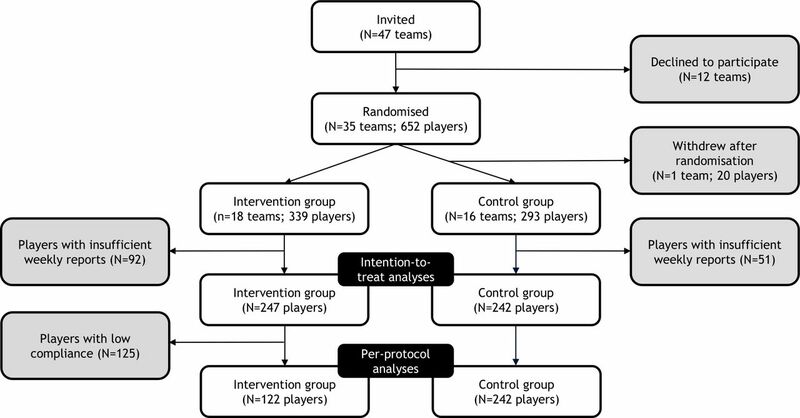 A substantial groin problem was reported by 28% of the players in the intervention group and 37% in the control group. Characteristics of the reported problems are shown in table 5. Players in the intervention group included in the ITT analysis completed on average 73% of the recommended preseason protocol. During the competitive season, the Adductor Strengthening Programme was completed on average 0.7 times per week (range 0.6–0.9), equivalent to 70% of the recommended exercise prescription. Forty-two per cent of the players had an average in-season weekly compliance higher than our recommendations, two players (1%) did not complete any of the recommended preseason training sessions and seven players (3%) did not complete any of the recommended in-season training sessions. Players included in the PP analyses completed 93% of the recommended preseason training sessions and on average completed the programme 0.9 times per week (range 0.7–1.0) in-season. We had no reports on any adverse events related to performing the study intervention. This is the first study investigating the effect of an Adductor Strengthening Programme using a single-exercise approach to reduce the prevalence of groin problems in football players. Our main finding was that the Adductor Strengthening Programme reduced the prevalence of groin problems among male football players; the risk of reporting groin problems during the competitive season was 41% lower, in favour of the intervention group in the ITT analysis and 47% in the PP analysis. Another reason why we may have found an effect where previous studies have not is that the compliance reported in the present study was much higher than what is often seen in sports injury prevention trials.3 29–31 On average, the players completed approximately 70% of the recommended protocol during both preseason and the competitive season. Actually, 42% of the players included in the ITT analysis had an average in-season weekly compliance higher than our recommendations. However, compliance was self-reported by the players and we do not know if they performed the exercise as often as reported. The compliance reported in other studies examining the preventive effect of an exercise programme on groin injury rate varies. Engebretsen et al reported that players had a 19% compliance with a programme including static and dynamic hip adduction strength and abdominal exercises,27 while studies examining the effect of the FIFA 11 have reported from 52% to 73% compliance with the programme.30 31 Silvers-Granelli et al reported a mean utilisation of the FIFA 11+ of 30 sessions during a season, which they interpreted as moderate.5 Hölmich et al did not report any data on compliance with their programme including static and dynamic hip adduction strength, abdominal exercises and stretching.28 Compliance is believed to be a key factor. In two large RCTs on the FIFA 11+ programme, the risk of sustaining an injury was lower for the high compliance group, compared with players having intermediate or low compliance.5 6 This is also indicated in our analysis, where the PP analysis showed an even lower risk of groin problems than the ITT analysis. The single-exercise approach in the present study must be considered a large advantage as the time required by the teams is short. The in-season protocol of the Adductor Strengthening Programme consists of only 1 weekly session, which takes <5 min to perform. However, this may also be considered a limitation as we have only specifically targeted one of four defined clinical entities for groin pain.32 We would argue that targeting the adductors addresses the main problem as adductor-related groin pain accounts for >2/3 of all hip and groin injuries in football.2 11–14 It is unknown specifically which entities were affected by the Adductor Strengthening Programme. The effect of the exercise prescription dosage on hip adduction strength is unknown. We have data on different protocols of the CA, as used at level 3 in the current programme. A 36% increase in eccentric hip adduction strength was found in players performing the CA intensively for 8 weeks,19 whereas a less intensive 8-week protocol used in a different study showed an 8% increase.18 The preseason protocol used in the present study, with only one set per side per session, is likely to induce a strength increase in the lower range of these results. Additionally, we did not register the level of the protocol performed by each player. As previous studies indicate a dose–response relationship on eccentric adduction strength,18 19 it can be speculated that a higher intensity protocol would result in an even lower risk of groin problems. The optimal exercise prescription to maximise the effects on injury risk needs, however, further exploration. Although we had no reports of any adverse effects, the lack of a systematic approach to register events should be considered a limitation of the study. However, our findings are similar to other studies showing no reports of any adverse effects when performing the CA.18 19 Furthermore, players in these studies reported very low delayed-onset muscle soreness (DOMS) in the hip adductors when performing the exercise. The individual highest values were related to the starting date, increase in load or associated with football training.18 19 Thus, we think that the Adductor Strengthening Programme is safe to perform and the careful progression in the exercise prescription was important to reduce the risk of DOMS and adverse events to a minimum. The preventive effect from structured interventions like the FIFA 11+ is well known;4 however, the specific effects of these general programmes are unclear. Only two papers report effects on hip/groin injuries, with conflicting results.5 6 In the same way that the Nordic Hamstring exercise is included in the FIFA 11+ to specifically target hamstring injuries, the three progression levels of the Adductor Strengthening Programme are suggested to be included in the FIFA 11+ programme to specifically target the adductor muscles and their associated groin problems most often seen in male football. A strength of this trial is the use of the OSTRC Overuse Injury Questionnaire. This method has been shown to be more sensitive than injury recording based on a time-loss definition, capturing all groin problems.7 33 Actually, a promising non-significant 31% reduction in groin injury rates was shown in 977 Danish amateur male football players.28 The results from this trial indicate that the study has been underpowered to detect an effect on time-loss injuries. Our data therefore represent a more complete picture of the extent of groin problems in football, with a large share of problems leading to reduced training participation, training volume or performance but fewer leading to time loss. Another strength of this trial is the inclusion of players already having groin problems. Traditionally, players with problems at baseline are excluded, recording only new cases during the intervention period. From a previous study, we know that >50% of the players reporting groin pain in the previous season still had pain at the beginning of the new season.9 Removing players having groin symptoms at baseline would have resulted in a group not being representative for the population of footballers where groin problems are very common. There are some methodological limitations in this study. First, the retrospective registration during the last month of the study may induce a recollection bias and represents a limitation to the injury registration. The decision to register retrospectively groin problems was done to ensure sufficient data for the analyses. Aiming to reduce recall bias, players had access to a document summarising their previous questionnaire responses and match fixtures when completing the retrospective registration. Still, there is a potential for recall bias; however, it seems highly unlikely that this would affect players in the intervention and control groups differently. Second, deviations from the registered protocol should be considered a limitation of any trial. The decision to remove players with a low response rate was done to ensure sufficient data to perform imputation. The majority (77%) of the enrolled players were included in the GEE analyses. Although the postrandomised change of criteria for the analyses may introduce bias,34 the decision to diverge from the protocol was taken prior to the analyses and was based on the response rate, irrespective of whether or not they had actually performed the Adductor Strengthening Programme. In addition, difference in subscales scores of the HAGOS between the players removed from the analysis, compared with the once included, indicates that players with lower response rate (<75%) had more severe symptoms at baseline. However, we considered these small differences not clinically relevant. Furthermore, there were no differences in any of the subscales when comparing removed players from the intervention group with the ones removed from the control group. The Adductor Strengthening Programme substantially reduced the prevalence and risk of groin problems in male football players. We recommend that the programme be implemented as a part of normal football training. The Adductor Strengthening Programme, based on one single exercise with different progression levels , reduced the prevalence and risk of groin problems in male football players by 41%. The Adductor Strengthening Programme should be implemented as a part of normal football training. We suggest to include the three progression levels of the Adductor Strengthening Programme in the FIFA 11+ programme to specifically target the adductor muscles. The authors thank EE Eriksen, M Lislevand, K Nordanger Martin, K Hammond Rosbach, A Kjøsnes, A Megård and ID Andersen for their assistance in data collection. They also thank all players and coaches who participated in the study, as well as the team medical staff.
. Dynamic hip adduction, abduction and abdominal exercises from the holmich groin-injury prevention program are intense enough to be considered strengthening exercises - a cross-sectional study. Int J Sports Phys Ther 2017;12:371–80.
. Flexible Imputation of Missing Data. Hoboken: Taylor and Francis, 2012.